A geeky portrait of every Asian action figure from the Star Wars saga. Do you like Star Wars? Do you like Star Wars action figures? Our friend David Yeh really likes Star Wars action figures. 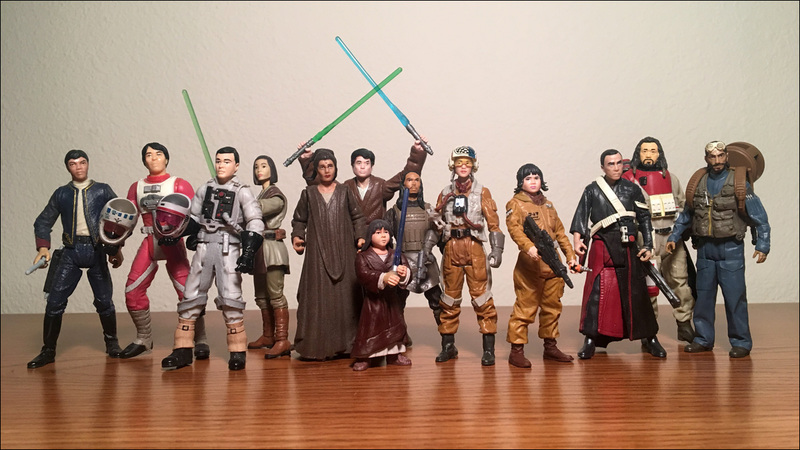 He recently shared this awesome (and incredibly geeky) photo highlighting his collection of all the Asian characters -- yes, there have been a handful, major and laughably minor -- from across the entire Star Wars saga that have been produced over the years as action figures (including the recently released figures for Rose and Paige from the upcoming Last Jedi). There are only about a dozen, which, considering the massive number of Star Wars toys that have been produced in the last four decades, is not a lot. This guy is literally in the background of one shot in Cloud City. This figure is incorrectly named. He should be Lt. Telsij, wearing a gray outfit. This is the Y-Wing pilot who famously screams "I'm hit!" before crashing during the Battle of Endor. Jedi Knight played by Mimi Daraphet in Attack of the Clones. Jedi Master played by Dipika O'Neill Joti in The Phantom Menace. Offered as part of a Toys 'R' Us exclusive "Battle Of Geonosis: Jedi Knights" multipack, this character does not actually appear in the film, but the figure's portrait sculpt is modeled after Lucasfilm staffer Leeland Chee. The ethnicity of this figure is somewhat questionable. They really should make toys for the rest of the members of Kanjiklub. Played by Kelly Marie Tran. Not pictured: Sabine Wren from Star Wars: Rebels. On my wish list, I'd still love to see figures for Admiral Statura and Jes Pava from The Force Awakens.